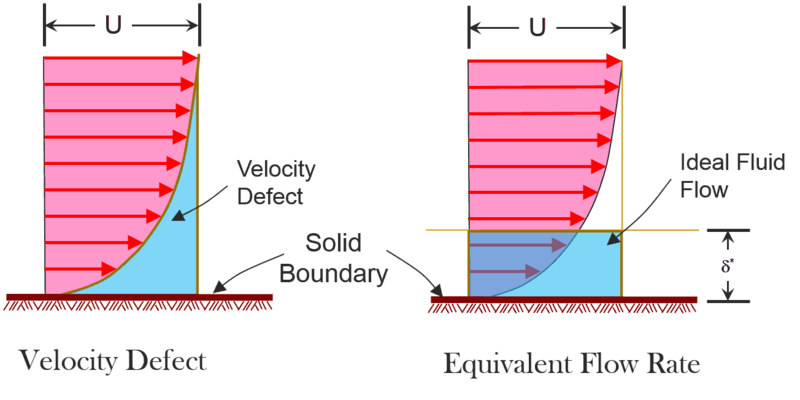 Nominal thickness of the boundary layer is defined as the thickness of zone extending from solid boundary to a point where velocity is 99% of the free stream velocity (U). This is arbitrary, especially because transition from 0 velocity at boundary to the U outside the boundary takes place asymptotically. It is based on the fact that beyond this boundary, effect of viscous stresses can be neglected. 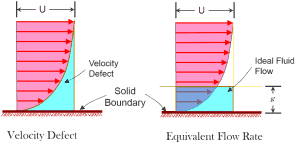 Presence of boundary layer introduces a retardation to the free stream velocity in the neighborhood of the boundary. This causes a decrease in mass flow rate due to presence of boundary layer. A “velocity defect” of (U-u) exists at a distance y along y axis. Displacement thickness may be thought of as the distance (measured perpendicular to the boundary) with which the boundary may be imagined to have been shifted such that the actual flow rate would be the same as that of an ideal fluid (with slip) flowing around the displaced boundary. This may be imagined in as explained in figures on next page. Considering a small control volume of sides Dx and Dy and thickness in the third direction as unity is considered as shown on next page.